Poor Onua Nuva! In a shocking turn of events, Onua Nuva has been possessed by a Krana and has even infected Lewa with a Krana. Kopaka is in a tricky spot. He could probably rescu Lewa, but Onua Nuva far outmatches his ice powers. The Bohrok, recently under the control of Mystical Blue Masking Tape, are again free. Nuhvok Kal was probably just giving the little Va directions to the nearest Tully's but has sheared his head clean off. Oops. 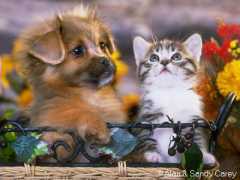 A well-meaning co-worker forwarded this heartwarming image in an attempt to soothe my troubled brow. Much in the vein of the 'Hang in There' kitten. In Bad Taste or Merely Oblivious? 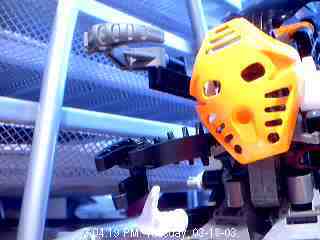 The following was copied from www.bionicle.com. Given the events in Iraq, I am hard pressed to say whether the good folk at Lego are having a little dark fun or are simply presenting the scenarios they wrote months and months ago. 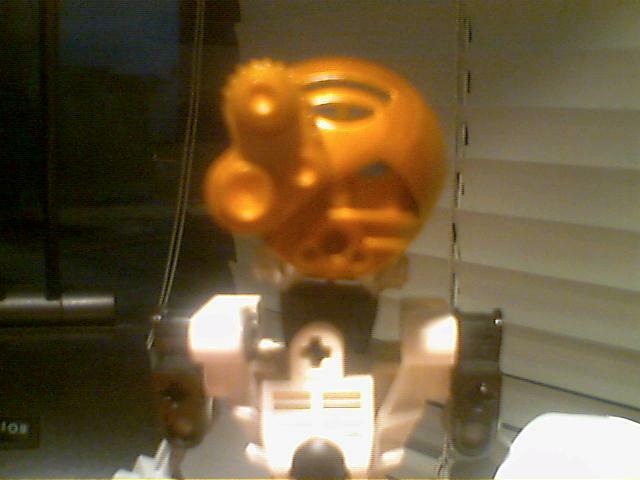 The Toa had tracked the thieves of their symbols all across Mata Nui, returning at last to the sandy expanse of Po-Wahi. Deep in the desert, they finally caught up with the mysterious Bohrok-Kal. 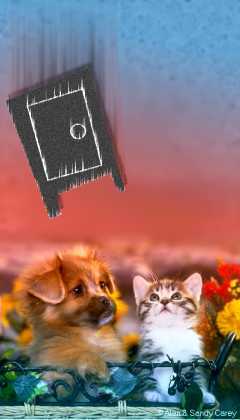 The creatures’ eyes glowed with a cunning intelligence. Their gleaming shells bore reptilian patterns surrounding strange symbols. They raised their shields and, incredibly, they spoke! Angered by their tone, Lewa Nuva leaped into action, but the impulsive Toa of Air found himself pinned in place by the magnetic force of Gahlok-Kal. Onua Nuva tried to end the battle with a single blow, but Pahrok-Kal’s plasma held him at bay. 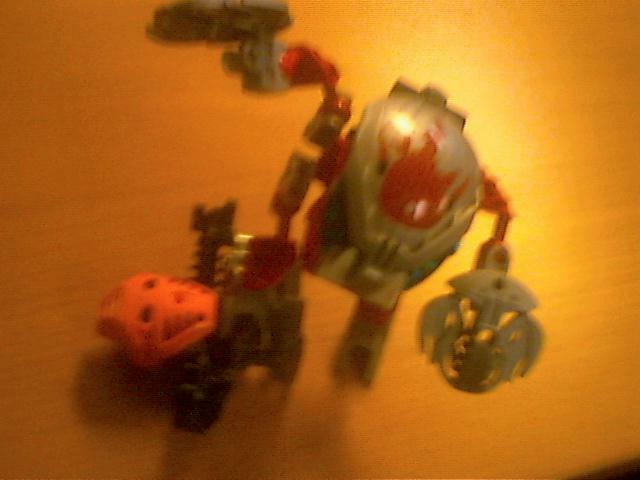 As Tahu Nuva attempted to protect his fellow Toa with the Mask of Shielding, Nuhvok-Kal’s mastery of gravity sent him crashing to the ground. 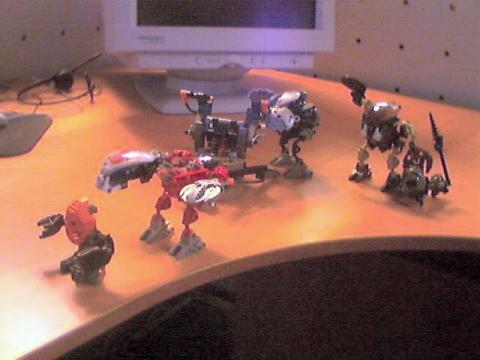 Then the Bohrok-Kal turned the full force of their powers on the heroes of Mata Nui. When the Toa Nuva awakened, the creatures were gone. Now the quest of the Toa Nuva has become even more desperate. They must find the Bahrag, defeat the Bohrok-Kal and end the threat of the swarms for good – all without the aid of their elemental powers! The conflict took an ugly turn today when Lewa, Toa of Air, arrived and immediately began beheading prisoners. Lewa was not available for comment. 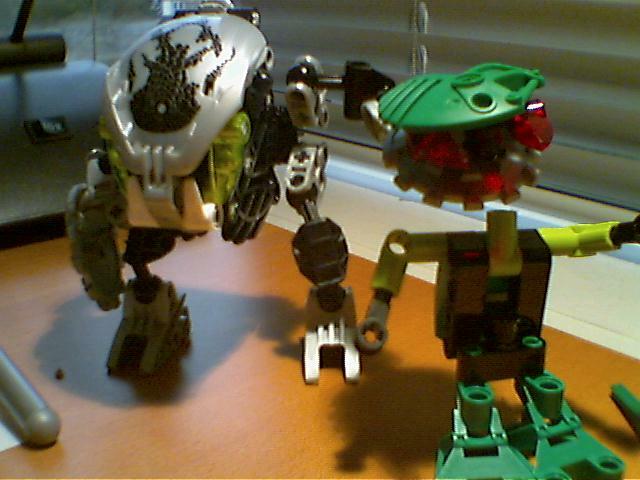 Ask not for whom the Bionicle monster trolls, it trolls for thee! Got a used copy of Tron on Friday. It's really good, much better than I remember. The 2nd disc of extra is not that great. UPDATE Unbelievable but true. My girlfriend does not like Tron. Color me dumbfounded. 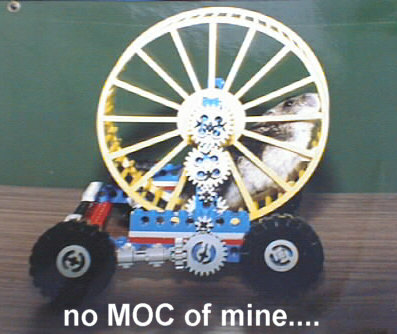 The impetus for this slideshow was a visit by a small child and the consequent disassembly of some of my Bionicle. A fine time was had by all. A slide show of pictures of events touching on myth. Gali, Toa of Water, announces her intention to contain the Bohrok menace. 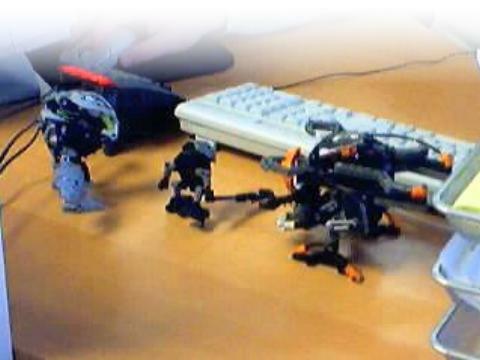 The Bohrok are welcome to stay in our fair domain, but their overlords, the Krana, must return to from whence they came. These are the words of Gali, Toa of Water. Away from his Boxor vehicle, Nuparu is easy pickings for any Bohrok. Kopaka surveys the terrible scene. The fiends are watching themselves on big-screen TV! Kopaka has a few thoughts he would like to share with Alf and Jordan. Release Whenua and Nuparu immediately or face the consequences. There will be no further communication except at the end of my sword. 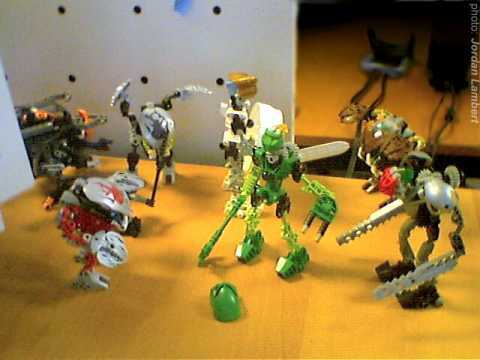 Here we can see that a trap has been laid for the valiant old fellow but he cannot hope to escape from two Bohrok Kal. 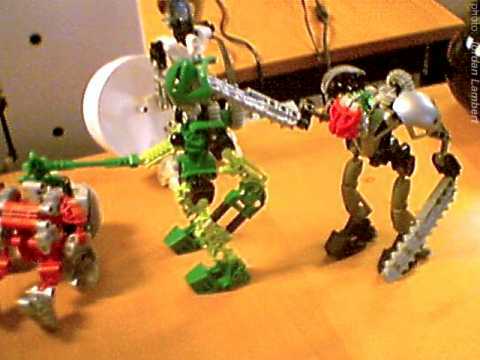 Nuparu has abandoned the Boxor vehicle in a brave but foolish attempt to help his friend and mentor who has been so cruelly and basely abused by the Bohrok. If only Onua had been there! I meant to display this before the war started. It's still valid. Also see this. I'm really excited by George Bush's latest reason for bombing Iraq: he's running out of patience. And so am I! For some time now I've been really pissed off with Mr Johnson, who lives a couple of doors down the street. Well, him and Mr Patel, who runs the health food shop. They both give me queer looks, and I'm sure Mr Johnson is planning something nasty for me, but so far I haven't been able to discover what. I've been round to his place a few times to see what he's up to, but he's got everything well hidden. That's how devious he is. As for Mr Patel, don't ask me how I know, I just know - from very good sources that he is, in reality, a Mass Murderer. I have leafleted the street telling them that if we don't act first, he'll pick us off one by one. Some of my neighbours say, if I've got proof, why don't I go to the police? But that's simply ridiculous. The police will say that they need evidence of a crime with which to charge my neighbours. They'll come up with endless red tape and quibbling about the rights and wrongs of a pre-emptive strike and all the while Mr Johnson will be finalising his plans to do terrible things to me, while Mr Patel will be secretly murdering people. Since I'm the only one in the street with a decent range of automatic firearms, I reckon it's up to me to keep the peace. But until recently that's been a little difficult. Now, however, George W. Bush has made it clear that all I need to do is run out of patience, and then I can wade in and do whatever I want! And let's face it, Mr Bush's carefully thought-out policy towards Iraq is the only way to bring about international peace and security. The one certain way to stop Muslim fundamentalist suicide bombers targeting the States or the UK is to bomb a few Muslim countries that have never threatened us. That's why I want to blow up Mr Johnson's garage and kill his wife and children. Strike first! That'll teach him a lesson. Then he'll leave us in peace and stop peering at me in that totally unacceptable way. Mr Bush makes it clear that all he needs to know before bombing Iraq is that Saddam is a really nasty man and that he has weapons of mass destruction - even if no one can find them. I'm certain I've just as much justification for killing Mr Johnson's wife and children as Mr Bush has for bombing Iraq. Mr Bush's long-term aim is to make the world a safer place by eliminating 'rogue states' and 'terrorism'. It's such a clever long-term aim because how can you ever know when you've achieved it? How will Mr Bush know when he's wiped out all terrorists? When every single terrorist is dead? But then a terrorist is only a terrorist once he's committed an act of terror. What about would-be terrorists? These are the ones you really want to eliminate, since most of the known terrorists, being suicide bombers, have already eliminated themselves. Perhaps Mr Bush needs to wipe out everyone who could possibly be a future terrorist? Maybe he can't be sure he's achieved his objective until every Muslim fundamentalist is dead? But then some moderate Muslims might convert to fundamentalism. Maybe the only really safe thing to do would be for Mr Bush to eliminate all Muslims? It's the same in my street. Mr Johnson and Mr Patel are just the tip of the iceberg. There are dozens of other people in the street who I don't like and who - quite frankly - look at me in odd ways. No one will be really safe until I've wiped them all out. It's just as sane as what George W. Bush is proposing and, in contrast to what he's intending, my policy will destroy only one street. 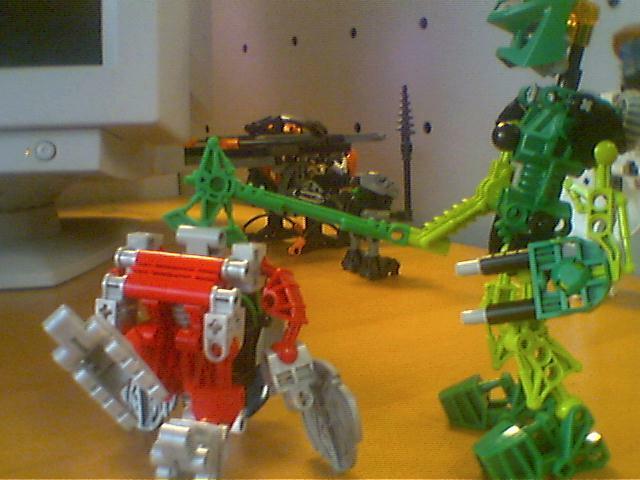 Nuparu has taken the battle directly to Alf's desk and is seen here giving Pahrak a wedgie. 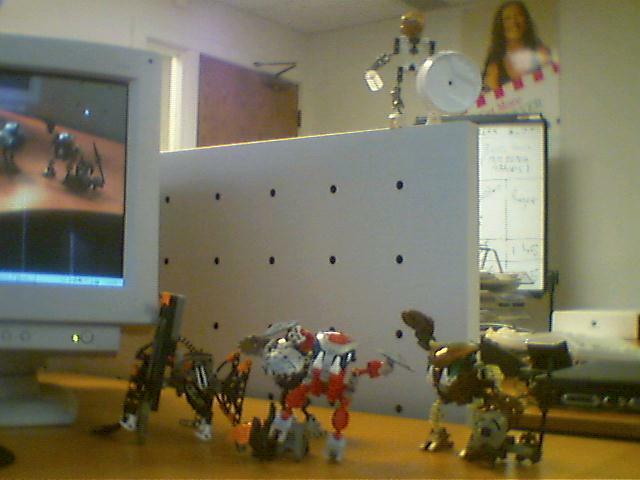 My desk was unmolested by Bohrok all day. 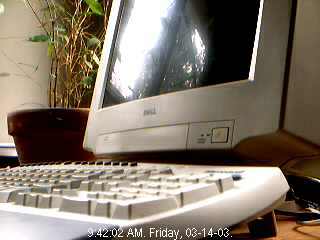 I attribute this to the the presence of this Boxor, manned by Nuparu. Or possibly that Alf and Jordan's Bohrok were sunning themselves in the window. COMING SOON: Another Toa Party! A while back there was a party and there were amusing consequences for the Toa. There was another party on Wednesday and there were consequences for the Toa Maiden. Amusing? You shall be the judge; slideshow to come. 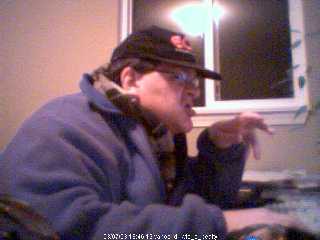 UPDATE:The slideshow will show up eventually - hold on! I've been drawing this squashed version of the Enterprise ever since I was a wee tad. Co-worker Alf (see Pillow Chair) enjoyed a Tahnok so much I gave him his own Pahrak. Co-worker Jordan admired Alf's Pahrak and went out and bought a Nuhvok Kal. 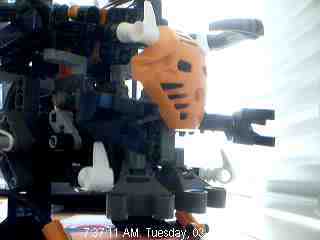 UPDATE: Jordan has added Tahnok Kal to his cohort of Bohrok. 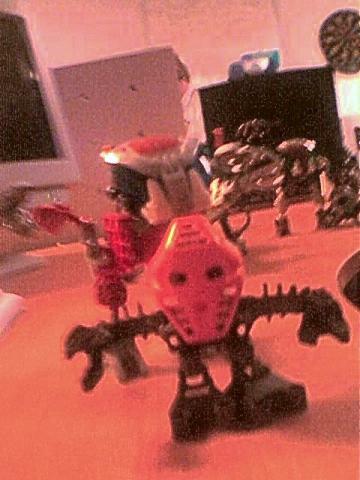 UPDATE UPDATE: Jordan has also acquired Onua Nuva, but has turned him to the Makuta side. 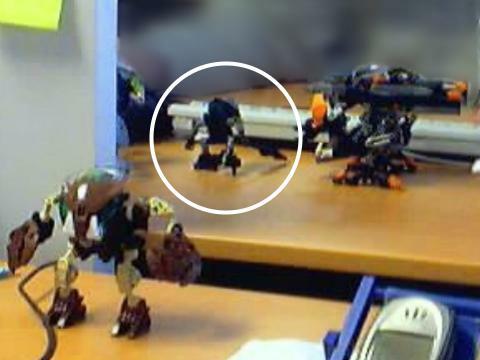 Co-worker Jeff may be the next to fall to the Bohrok invasion. Beloved child visited this week and played with Cahdok. The other Bionicle are chicken to be made into chicken pie. Adorable! But I like the lighting. I-Cybie has been fed and exercised. Battery goes fast when doing headstands. UPDATE: Malyn has pointed out that I look much too much like Michael Moore in this pic. I couldn't agree more and will avoid baseball caps and ranting in the future. Love you, Michael, don't want to be you! Now that your expectations have been thoroughly lowered, enjoy! The Toa Maiden and her comrades run into a spot of trouble. This slide show has little story to tell. 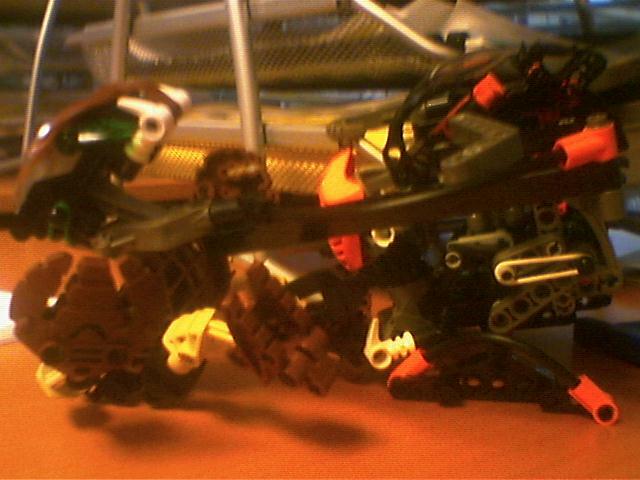 The Toa Maiden, some Matorans and a tame Bohrok named Bobo lift a Boxor vehicle up a short cliff. My goal was to capture some very late afternoon light. 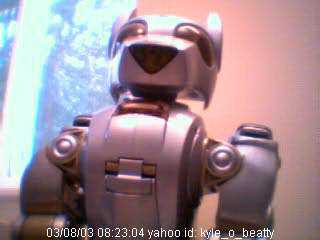 Then the battery in my camera gave out.